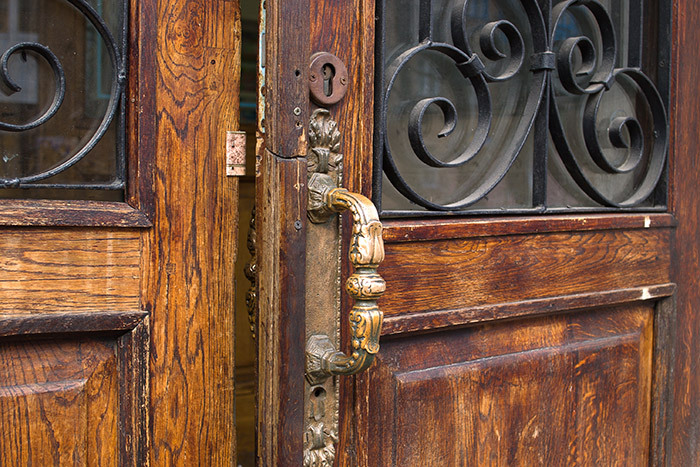 You may not spend much time thinking about your exterior doors until problems arise. They’re an essential element to keep your home running smoothly, so what should you do when you’re experiencing door problems? The best thing to do is to avoid them in the first place with proper installation. Also, you should educate yourself on the most common door problems homeowners face and their quick fixes. If you have concerns about the way your door is currently working, you’ll want to take a look at these major issues that many homeowners face daily. You may be able to help your home run a little smoother with just a few minor adjustments. When you open the door, is it loud enough to wake up your sleeping newborn from the other side of the home? Squeaking or loud creaking is one of the most common and annoying door problems that homeowners face. It can be a major source of frustration for everyone in the home, even if it doesn’t cause any major structural difficulties. You can silence your loud door with just a few spritzes of lubricant directly on the hinge pins and the latches. If you don’t have any spray lubricant like WD-40, you could substitute a little bit of olive oil or petroleum jelly. Open and close the door a few times after you spray it to allow the lubricant to work all the way through the mechanisms. After you’re finished, the friction between the metal hinges should be lessened and so should the overall squeaking. Whether it’s your front door or a bedroom door, you want to be able to shut it completely to maintain your privacy. Your door may hang open for a number of reasons, but it could be related to your locks and latches if the door was recently installed. The strike plate that’s installed on the door frame may not perfectly align with the latch, causing the door to bounce open each time you try to close it. Like many of the more common door problems, this has a relatively simple fix. You’ll need to move the strike plate so that the latch can fully enter it. Be sure to measure carefully and drill out a deep enough hole for the new latch. You want to live in a comfortable home regardless of what the weather is like outside. This is why the HVAC system runs year-round in many parts of the country. Unfortunately, a drafty door could be undoing all of the hard work that your air conditioner or furnace are producing. Experiencing a draft is one of the most common door problems that may require just a few minutes in order to repair or replace a damaged element. A draft most often leaks in around the door as a result of bad weatherstripping. This rubbery substance is designed to seal the area around the door and keep the outdoor air outside where it belongs. Over time, the weatherstripping can deteriorate and may need to be replaced. Simply remove the old areas and install new using a roll you can purchase at a local home improvement store. If it’s not the weatherstripping, you may need to replace the entire door. This is because it has warped, expanded or contracted to the point that there are gaps between the door and the frame. Don’t worry – Feldco makes door replacement easy. Perhaps you have the opposite of a door that won’t close. Another one of the most common door problems is when it sticks while attempting to open it. You may have to throw your weight into the door to push it open because it’s jammed so tightly into the frame. During certain seasons, particularly those that have higher humidity levels, this is an extremely common occurrence. 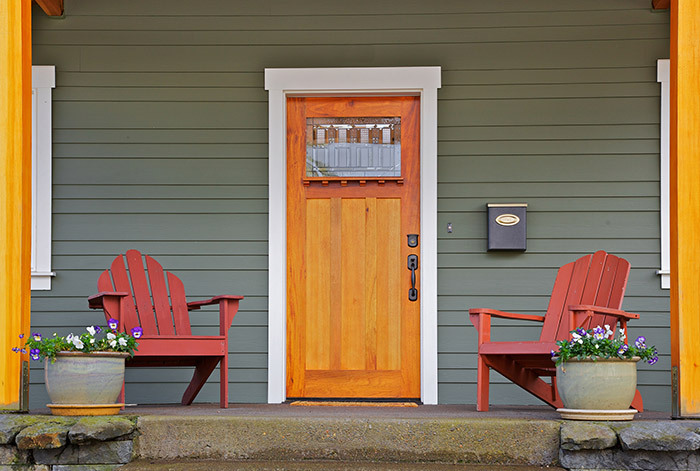 Wood swells with exposure to moisture in the air which can make your door fit tighter into an expanded door frame. The solution to a sticky door is a little more difficult to determine than some of the other door problems. You may be able to alleviate the sticking by widening the reveal (the area where the door meets the door frame). Ideally, you should be able to insert the width of a small coin into this area. If you can’t, you may need to shave down the door frame or purchase a slightly smaller door. Loose screws are a relatively common door problem that can result in a number of unlikely issues. You may have difficulty shutting the door or getting it to stay shut as a result of these tiny but essential items. When the door isn’t held flush to the door frame like it should be, the end result could mean sagging and a door that doesn’t fit properly. Tighten the screws using a handheld screwdriver or power drill to solve the problem. This requires very little handiness and could solve several of the most common door problems. Do you hear your doors rattle around in their frame every time the air conditioning or heat turns on? While this isn’t harmful to the structural integrity of your home, it can be obnoxious and disruptive to a peaceful living environment. This issue is most often caused when there’s too much space between the door and the frame. Even a small amount of air can push it around and cause rattling in that excess space. The trick to solving these door problems is to remove the excess space. Most home improvement stores will sell foam pads or strips that can be installed in the door frame. While it may not be the most attractive solution, it’s the fastest way to keep rattling at bay. Long term, you may want to consider replacing your door with a larger one that would take up a more appropriate amount of space in the door frame. You don’t want to bang an unnecessary hole in your wall with a door that swings open too far. Particularly with small children, a door that opens too far can cause damage rather quickly. Fortunately, this is another super simple fix that anyone can manage on their own. You have two main options to correct these door problems. Doorstops are available that’ll install on the floor behind the door or those that can be placed in the hinge pin. Either option will prevent the door from opening widely enough to cause damage to the wall behind it. They should all have a rubber piece that prevents damage to the door as well. Be sure to replace any doorstops that are missing this rubber piece, as the metal beneath could place a hole in the door. Many homeowners face a few of the same common door problems as the seasons change and the conditions of their home shift. With just a little bit of elbow grease, you can eliminate or seriously reduce the long-term effects of these problems. Find out what you can do to help quiet your home and help your door fit into the frame better today. Need to replace your entry, storm or patio door? Look no further than Feldco for the best door replacement in Madison. It’s as easy as getting a free quote online.